This release about Washington Mutual’s Talking ATMs was issued as a result of a Settlement Agreement negotiated by Lainey and co-counsel Linda Dardarian on behalf of the California Council of the Blind, the Florida Council of the Blind, and individual members of the blind community. Read the full Washington Mutual Settlement Agreement, which also covers the accessibility of the bank’s website and its alternative format program. Seattle, Washington (August 20, 2002) — Washington Mutual, the nation’s seventh largest financial services company, today announced it has introduced ATMs that speak to the user in both the English and Spanish languages. Talking ATMs are designed to assist those who are visually impaired with using an ATM. Washington Mutual is believed to be the first financial services company in the country to add a second language to Talking ATMs. This device makes it easier for people who are visually impaired and not able to read Braille to gain access to their bank accounts just like everyone else through an ATM. And offering the service in Spanish is a real plus for those who prefer to bank in their own language. California and Florida affiliates of the American Council of the Blind praised Washington Mutual’s commitment to accessible banking. “We appreciate WaMu’s recognition of the need for blind and visually impaired people to bank independently,” said Catherine Skivers, president of the California Council of the Blind. “With a Talking ATM, for the first time in my life I was able to bank privately, something that most sighted consumers take for granted,” said Jesus Garcia, First Vice President of the Florida Council of the Blind. When all the machines are deployed by 2005, roughly 1,500 of Washington Mutuals over 2,300 ATMs will be Talking ATMs. All of the Talking ATMs speak in both the English and Spanish languages. There will be at least one Talking ATM at each of Washington Mutuals more than 1,400 financial center locations, and at least one at each non-branch ATM location. Any customer or non-customer may access the Talking ATM by inserting a standard headset into an audio jack located on the front of the machine. Headsets are available at no charge by calling our toll free number. Every transaction a sighted customer can read on screen during a transaction can be spoken in both English and Spanish. If a customer requests a receipt, it will be spoken and printed. Additionally, the machine offers a spoken tutorial and user guide for those using the Talking ATM for the first time, or anyone who would like extra help or time with the ATM. 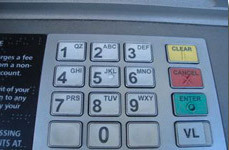 Washington Mutuals website has a Talking ATM locator with instructions so visually impaired customers can obtain the user guide over the web before visiting a Talking ATM. During the development stage, Washington Mutual invited 37 visually impaired testers to try the initial version of the Talking ATM. The testers extensive feedback was used to enhance the ATMs capabilities. With a history dating back to 1889, Washington Mutual is a national financial services company that provides a diversified line of products and services to consumers and small- to mid-sized businesses. At June 30, 2002, Washington Mutual and its subsidiaries had assets of $261.28 billion. Washington Mutual currently operates more than 2,500 consumer banking, mortgage lending, commercial banking, consumer finance and financial services offices throughout the nation.